This is a must watch! I often mention how the marxists / socialists / bolsheviks have infiltrated and co-opted this nation from within slowly through many decades. 2. Change their perception of reality even in the face of facts of said next generations so that they believe it implicitly. 3. That whole generation of citizens re-programed in enemy ideology and subversive lies now infiltrate United State society and on their own volition actively work towards implementing said enemy ideology. New blog post on the way! Encouraging everyone with a pulse to vote, regardless of circumstances, is one of the telling symptoms of what’s wrong in this country and society. With midterms tomorrow, there is quite the political fervor, the likes that hasn’t been seen in America in decades. This country is more polarized than it’s been in a long, long time. This is not just an election about policies, this more and more seems like an election about morality. Almost on the biblical scale of good vs. evil! People are so divided that they legitimately have nothing but hate and contempt for the other side, and view them not as fellow countrymen, but as the enemy. Not as neighbors, but as a fifth column. The democratic party, which is basically now the quasi American socialist party, has more extreme left candidates running for office than ever before. The republican party has also shifted from the impacts of the Ron Paul, Tea Party, and Donald Trump movements away from the old Neocon globalist conservatives and more towards a small government, nationalist, and general freedom conservative party. The liberty leaning citizens of this country are doing what the socialists did long ago with much success. Infiltrate one of the two major parties, and slowly twist the ideals and message of that party to their own over time. Hence, the stark difference you’ll find from democrats 50 years ago and democrats today. If a democrat from 50 years ago was running today, you would not even believe that they were from the same party. They would sound like a moderate republican! This is also known as the frog in boiling water tactic where you put a frog in a put and slowly turn up the heat, and before the frog realizes it, it’s cooked! Since socialism is a popular and prevalent form of government for the elite rulers of the corrupt third world, immigration from said third world is also another favorite tactic of the democrats as it helps them increase their voter base. Import impoverished people from countries where all they know and understand is socialism, offer them free handouts, and you’ll get them to vote for your power base. You have to give the democrats credit, they’ve done a masterful job of brainwashing the economically downtrodden into thinking that big government and socialist handouts are the way for them to get ahead and prosper. “Give me your tired, your poor, Your huddled masses yearning to breathe free…”? 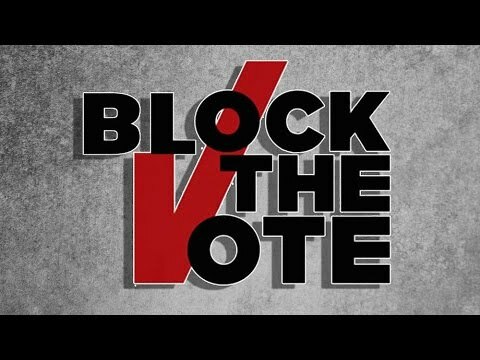 So really, “Rock the Vote” is a democrat (socialist) marketing tactic, and they know it. The more uneducated people view, the more votes they know they get! The worst thing you can do on election day is encourage uninformed and apathetic people to take part in the electoral process. People who don’t know what they are voting for, blindly picking candidates at random, is a great way to clutter up and disenfranchise the entire process. Back in the day, voting was considered a sacred privilege and not a universal “right”. You had to be established and educated in order to vote as when you vote you are using force, which is violence.